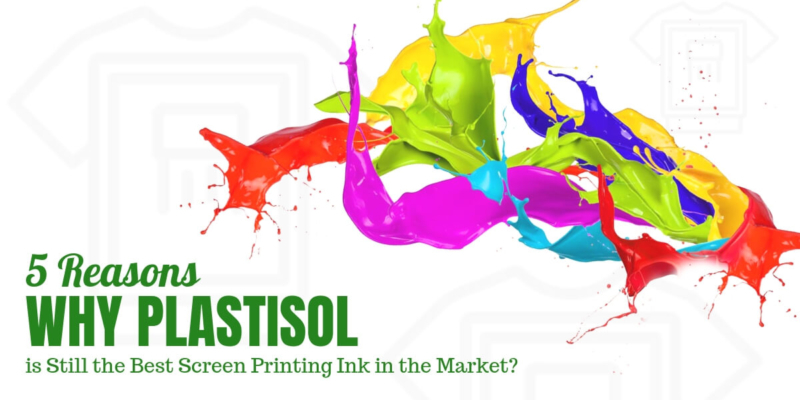 5 Reasons Why Plastisol is Still the Best Screen Printing Ink in the Market? You Are Here:inkXE Blog Web to Print Why Plastisol is Still the Best Screen Printing Ink? Its the tough question now Why Plastisol is Still the Best Screen Printing Ink? and What is Plastisol Ink? Since its inception in the 70s, plastisol ink has revolutionized the screen printing industry. It has become the industry standard since then, all thanks to its ability to create the glossy and permanent finish. Plastisol ink is one of the most durable and Best Screen Printing Ink options in the market. It is made from PVC resin and plasticizers which gets activated when the temperature reaches to 330° F. The plasticizers react with resin to create a permanent glossy print that doesn’t wash away. Here are top 5 reasons why Plastisol is the Best Screen Printing Ink & most sought-after ink by screen printers. Plastisol ink creates vivid and vibrant prints that other ink can’t produce. Even with darker colour substrates, it creates a vivid print. Unlike water-based and discharge inks, it layers on top of the substrate rather than absorbing it to the fabric so you can create bright and solid prints on any substrate. Unlike water-based inks, plastisol doesn’t dry out that easily, which screen printers appreciate who employ water-based inks. Plastisol has to reach the extreme temperature to cure and it doesn’t harden in the screens during long press runs. On one hand, it makes printing jobs much easier, on the other hand, print shops can reuse the screens in short order which you don’t need to clean out between jobs. You can simply scrape back the excess ink back into the bucket for reuse. You can use various kinds of additives with plastisol ink, so you can modify it to accommodate any look you want on your t-shirt for all screen printing job. You can use reducers to thin out the ink and make it easier to print with. To get a lighter feel you can use soft-hand additives. You could even use glitter, suede, and puff to get special effects on your t-shirt prints. Plastisol is a user-friendly choice for screen printers because it has various uses. It can be print wet-on-wet in which the printers apply an underbase, flash cure it and print over quickly. Moreover, they blast out the pinholes faster with a spot gun. Plastisol ink doesn’t need special attention for its disposal. Cured plastisol is not even considered hazardous in many places. So, if you need to dispose of some excess plastisol ink, you can simply cure it and get rid of it. Today, it produces one of the most durable and bright prints and possesses easy-to-work-with properties. For its many benefits, experts conclude that it is going to stay in the screen printing industry for a long time. Printers would turn to plastisol from time to time when they need a versatile print job. In fact, we believe it’s popularity will only increase over time. Let us know your views on plastisol in comments.